Home General News Do you recognise this? Is it part of Sleights’ defense system, connected into Fylingdales pyramids? That has been denied by higher authorities including Sleights Parish Council. 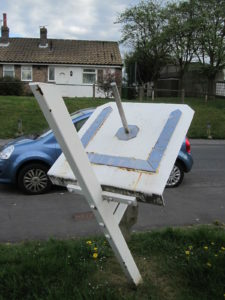 Their cover story is that this is a sundial – what, in North Yorkshire! It is an asset, apparently, which they have custody of, including maybe other assets like Shedder and Parish Councillor Lloyd Smith. Assets don’t just sit there, they deteriorate. SAMS received the following request from Parish Clerk Victoria Pitts. We are currently undertaking a review of our parish council assets, and whilst I am going out to get quotations for some of the work, I thought I would approach you and the Men’s Shed group with the possibility that, as you did such a fantastic job with the village pump fence, whether the Shed would be up for painting the sundial on Ingham Close (old photo attached)? Who knows the history of this? Do you? We will be asking Sleights Oracles (like Lloyd Smith and Mary Gullon). What is it’s official name – Sundial of the North?